Im not a big fan of "brazeness" and "bizzare" . Yeah ı get it it has a unique touch. Very charismatic characters, very memorable music and some good cinematography. But tons of historical missconceptions, tons of unnecessarily builded scenes and dialogs. Its too much... Too long, too post-modern. 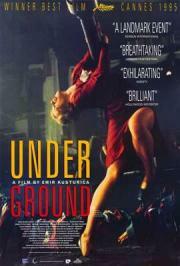 Kusturica takes craziness to the whole new level. It's very entertaining and funny to watch and it's a good recap of the history of Yugoslavia. Goran Bregovic makes an incredible work making the music for the movie which helps to create this uniquely wild Balkan atmosphere. Blacky is the most manly character in the history of cinema! the cartoonish wackiness was really not my thing. Couldn't bother to watch more than 55 minutes. Very off-putting and dirty.